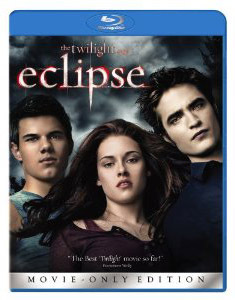 The Twilight Saga: Eclipse is now available on Blu-ray Disc and DVD in several packaged variations. On hi-def Blu-ray, ‘Eclipse’ is available as a Single-Disc edition or Single-Disc Blu-ray/DVD Combo. On DVD, you can get it as a Single-Disc edition or Two-Disc Special Edition. The Twilight Saga: Eclipse from Summit Entertainment features audio commentary from stars Robert Pattinson and Kristen Stewart, as well as Twilight writer Stephenie Meyer and producer Wyck Godfrey. A six-part “Making of” documentary is also included, with the Blu-ray edition containing Picture-in-Picture capability. The Blu-ray discs also contain deleted and extended scenes, a photo gallery, music videos, Fast-Forward option to your favorite scenes and characters, and additional extras. Order The Twilight Saga: Eclipse from Amazon.com and get $5 worth of eligible movies and TV shows from Amazon Video On Demand.